The Xenungulata (zeen-un-gu-la-ta), whose name literally means “strange ungulates” or “strange hoofed mammals”, is an archaic and poorly known group of South American mammals that are currently only known from the Paleocene and early Eocene. In 1958, Paula Couto coined the order Xenungulata together with the family Carodniidae, which today contains a single genus with three known species; Carodnia feruglioi, C. vieirai, and C. inexpectans. Later, in 1987, a second family called Etayoidae was established with the two species known today; Etayoa bacatensis and Notoetayoa gargantuai. 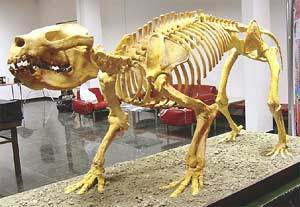 As with most early Paleogene animals, xenungulate fossils are very scarce. In spite of their scarcity, however, xenungulates are known to have lived throughout the South American continent and were the largest terrestrial mammals in their environment with body mass estimates for C. vieirai ranging from 450 to 720kg. By far the best known member of the group is the species C. vierai, which is known from reasonably complete skeletal material. C. vieirai was somewhat tapir-like in its size, build, and presumably in its ecology. 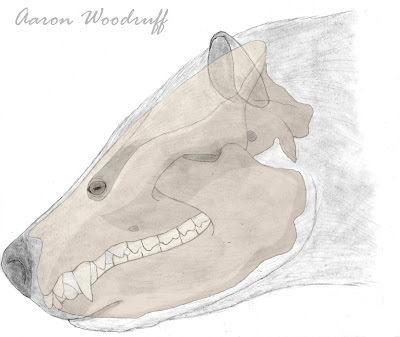 It had a complete dentition with procumbant, laterally flattened incisors and particularly large canines which may have been used as combat weapons against rivals or predators. The cheek teeth were low-crowned and well-suited to a browsing diet which likely comprised mostly of leaves, twigs, and fruits. The foot bones are unique among South American ungulates in that they are short and robust, and the digits terminate in broad, flat, unfissured hoof-like unguals. The limbs are short and somewhat slender, and their anatomy seems to suggest an elephant-like gait. Xenungulates have been considered to be close relatives to both the South American pyrotheres (Pyrotheria) and North American uintatheres (Dinocerata) based mainly on dental similarities with the two groups; the first and second molars are bilophodont as they are in advanced pyrotheres, and the third molar is more complex and lophate as in uintatheres. However, these characteristics are likely the result of convergent evolution rather than a shared heritage. The discovery of the more basal Etayoa in 1987 confirmed this; unlike uinatheres or its later relative Carodnia, it lacked a lophate third molar, thus confirming that this trait evolved separately from uintatheres. Furthermore, since bilophodonty is not present in basal pyrotheres from the early Eocene, we can also conclude that this trait evolved separately in the Xenungulata and the Pyrotheria. A parsimonious tree showing the proposed relationships between members of Xenungulata. Cropped from Figure 3 in Gelfo et al., 2008. Bilophodont: when two separate crests form transverse, often ring-shaped ridges on the tooth. Lophate: describes a cheek tooth with heightened ridges or crests. Ungual: the distal phalanx from which the claw or hoof grows.